Ph.D. in Fashion Design is a 2-year doctorate level course that allows students to study fashion at the research level. To pursue research level studies in Fashion Design a candidates should have a Master’s Degree in Fashion Design/ Fashion Technology or Management from any recognized Indian or Foreign University with minimum of 55% marks or equivalent grade point average. The selection to the programme is primarily done on the basis of Research Proposal and the Form submitted by the candidates during the time of admission. The shortlisted candidates will be called for final selection through presentation and personal interview. Ph.D. in Fashion Design aims to impart knowledge and carry research on the nature of design, especially in the context where designers could contribute towards a more sustainable environment. The course should be taken up by highly creative and motivated professionals who want to conduct intensive and rigorous research in fashion. The average annual fees for the programme shall be between INR 1 – 1.2 Lac, differing as per semester/annual pattern. Ph.D. in Fashion Design opens up avenues as professor and assistant professor, teachers in fashion institutes, colleges and universities. Additionally, they are employed as Fashion Consultants, Fashion Stylist, Freelancer, Merchandisers and Fashion Designers. Recruiting Areas Colleges, Universities, Garment Stores, Reputed Export houses, Fashion Brands, Fashion Designers and Retail companies provide placement opportunities. Ph.D. in Fashion Design: What is it About? Ph.D. in Fashion Design programme is designed for candidates to carry research in areas like Design Process, Fashion Studies, Fashion Styling, Fashion Illustration & Design, Entrepreneur Development, Garment Construction, IPR Surface, Development Techniques, Research Methods, Elements of Textiles, History of Design & Fashion, Couture Design, Digital Illustration & Presentation, Manufacturing Process, Marketing and Merchandising. The coursework of Ph.D. in Fashion Design is highly practical that enhances design-related knowledge in a broad sense and belief that it shall make essential contributions to understanding, analyzing and improving the world of design. Students usually conduct multi disciplinary research that encompasses a wide range of theoretical, applied and technological topics. Ph.D. in Fashion Design is an entry to jobs in higher education institutions with excellent chances of employment chances in the fashion industry. With the degree in hand and industry experience one could easily have his or her fashion studio or boutique. 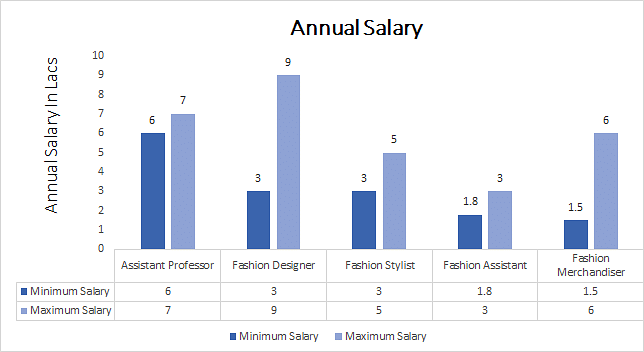 Freelancing as Fashion Experts doesn’t have any limits in terms of scope and remuneration. The admission to Ph.D. in Fashion Design course requires master’s degree in Fashion Design or other related area with minimum Cumulative Grade Point Average (CGPA) of 6.0 (on a 10 point scale) or 55% marks in aggregate (of all semesters or years). There is relaxation of 5% marks or equivalent CGPA for reserved category candidates. In case the Master’s Degree of a candidate is found to be irrelevant to the Research area, a minimum 10 years of professional experience (teaching or working) in the proposed research area is required compulsorily. Also, candidates holding PG Diploma are not eligible to apply. The admission process varies from institute to institute, where institutes like NIFT may or may conduct entrance test for selection of candidates and shall shortlist candidates on the basis of Research Proposal and Form submitted. The candidates shortlisted will then be selected through presentation and personal interview. On the collective merit of candidates, preliminary registration for Ph.D. in Fashion Design shall be done. Other institutes conduct entrance test in the concerned subject and select candidates on the basis of collective merit of marks scored in entrance test and personal interview. The syllabus for entrance is basically based on the subject of research. Research Proposal Students must prepare a Research Proposal on a subject related to any previous work/studies carried out by the candidate. It should include an explanation of the approach that a candidate would undertake during the research for example literature based, experimental, empirical or practice based research and must identify the outcome sought to be achieved. Synopsis Submission On completion of the research work, candidates are required to submit a Synopsis including bibliography of research work. Thesis Submission After submission of Synopsis a candidate must compulsorily submit the thesis within a stipulated time given by the institute. The Indian fashion industry is on rise and international fashion trends are always in demand among fashion lovers. The expected growth rate of 9.7% makes the Indian fashion industry a prominent player in the retail sector worldwide. Accompanying this is the edge India has over developed markets like US, China, Europe and Japan which have slower growth. The need for good, comfortable and trendy clothing has ultimately increased demand for people having out of the box thinking and talent. Ph.D. in Fashion Design students are always looked for by creative minds working in India or abroad. The top recruiters for people holding research aptitude include Raymond, Benetton, Indus League Clothing, ITC Ltd., Levis, Lifestyle, Modelama Exports, Omega Designs, Orient Craft, Pantaloon, Proline, Span India, Spykar, Swarovski India, Uni Style India, Texport Overseas, Snapdeal, Shoppers Stop, Pearl Global, Kimaya and Gokuldas. Candidates may even get opportunities to work with India’s top designers like Sabyasachi Mukherjee, Rohit Bal, Varun Behl and Raghuvendra Rathore. Ph.D. in Fashion Design holders may even plan a career as a freelancer or run a fashion boutique/store in their name.